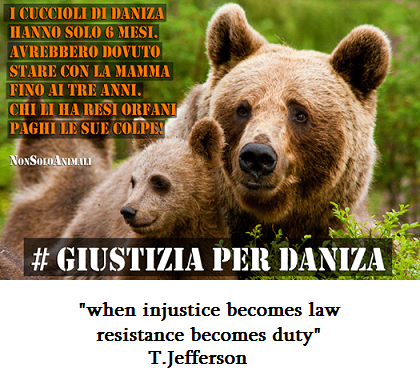 The killing of the female bear known as Daniza, in Italy, has been the paradigmatic event of a disastrous year of senseless violence against humans and non-humans alike (image above by Helga Marsala). 3. The year propaganda came of age. I take this expression from Ilargi on "The Automatic Earth". Propaganda is actually much older than 2014, but surely in this year it became much more shrill and invasive than it had usually been. It is shocking to see how fast and how easily propaganda plunged us into a new cold war against Russia. Also shocking it was to see how propaganda could convince so many people (including European MPs) that drilling more and "fracking" was the solution for all our problems. 4. The Ukraine disaster. It was a shock to see how easily it was for a European country to plunge from relative normalcy into a civil war of militias fighting each other and where citizens were routinely shelled and forced to take refuge in basements. It shows how really fragile are those entities we call "states". For whom is the Ukraine bell tolling? 5. The economic collapse of Italy. What is most shocking, even frightening, is how it is taking place in absolute quiet and silence. It is like a slow motion nightmare. The government seems to be unable to act in any other way than inventing ever more creative ways to raise taxes to squeeze out as much as possible from already exhausted and impoverished citizens. People seem to be unable to react, even to understand what is going on - at most they engage in a little blame game, faulting politicians, immigrants, communists, gypsies, the Euro, and the great world conspiracy for everything that is befalling on them. A similar situation exists in other Southern European countries. How long the quiet can last is all to be seen. 6. The loss of hope of stopping climate change. 2014 was the year in which the publication of the IPCC 5th assessment report was completed. It left absolutely no ripple in the debate. People seem to think that the best weapon we have against climate change is to declare that it doesn't exist. They repeat over and over the comforting mantra that "temperatures have not increased during the past 15 years", and that despite 2014 turning out to be the hottest year on record. 7. The killing of a bear, in Italy, was a small manifestation of wanton cruelty in a year that has seen much worse. But it was a paradigmatic event that shows how difficult - even impossible - for humans to live in peace with what surrounds them - be it human or beast. And this is just a partial list of the many shocking things of this year (maybe we can discuss that more in the comments). Then, what shocks will we see in 2015? 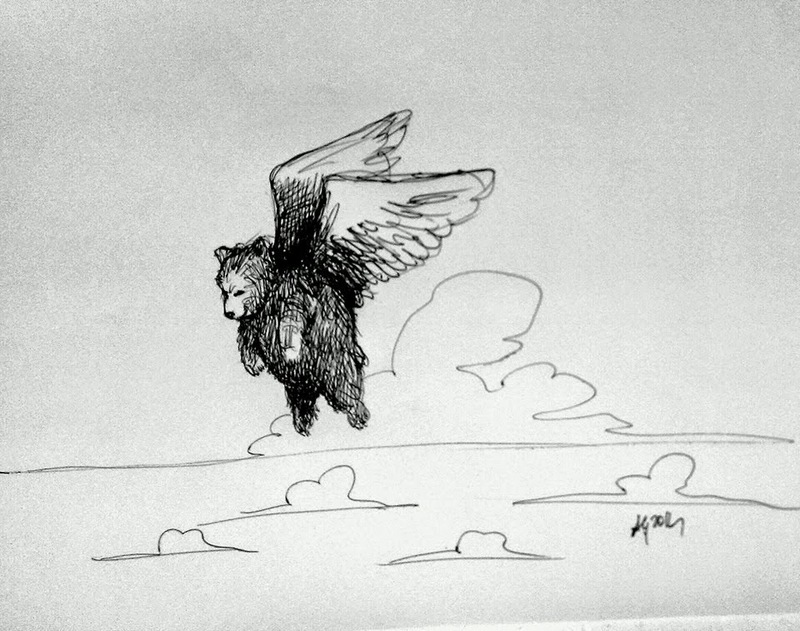 "The Bears' Famous Invasion of Sicily" is a story for children written by the Italian poet and novelist Dino Buzzati. It tells of how the bears came down from their mountains, defeated humans, and took over the government to create a society in which humans and bears live together in harmony. It is, of course, a fairy tale and some recent events in the Trentino region, in Italy, show how difficult it is for humans and bears to live together in harmony. And this is bad both for bears and for humans. There have been many shocking events in this eventful 2014, but the one that shocked me most took place in the Northern Italian region of Trentino, where a wild female bear named "Daniza" was hunted and killed in the name of security for the tourists of the region. A minor story, for sure, but one that explains a lot about the behavior of humans and the problems we have when we try to manage our wold. The story started this August in Trentino, when someone named Daniele Maturi stumbled into a wild female bear (known to humans as "Daniza") and her two cubs while searching for mushrooms in the woods. 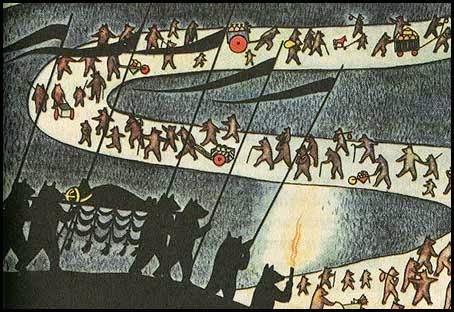 According to Mr. Maturi's own narration, he remained there to "observe the bears" instead of retreating as quickly and quietly as possible. The bear reacted attacking him, wounding him slightly, before retreating into the deep forest with her cubs. This generated a widespread public outcry, with calls for the elimination of the "dangerous animal," until Daniza was hunted down and killed by an overdose of anesthetic. Officially, it was a mistake, but more likely it was the result of the age-old attitude that says that "the only good X is dead X", where X can be Indian, bear, or anything deemed to be not human, or not human enough. In the end, Daniza's cubs may not be able to survive after the killing of their mother, but human cubs will be able to walk in a sanitized and safe forest where they won't risk to be attacked by anything larger and more dangerous than a squirrel. This sad story casts much light on the attitude of people in Italy about bears and about wilderness in general. It appears that in Trentino there exists a lively "anti-bear" movement - mainly organized by the Northern League - which, among other actions, had organized a dinner based on bear meat in 2011 intended to demonstrate what, in their opinion, was to be done with the wild bears of the forest. After that the story told by Mr. Maturi appeared on newspapers, hotel owners reported that many of their customers had canceled their reservations, out of fear of the wild bears. From the debate on the press and on the web, it appears that quite a number of people were genuinely concerned that their children could be devoured by wild bears if they were to take a walk in the parks of the Trentino region. On the other side of the debate, Daniza was praised for her restraint in not having killed the human intruder, when she could have easily done so. Mr. Maturi, instead, was insulted and vilified in all possible ways because of his idiocy in not leaving in peace a female bear with her cubs. 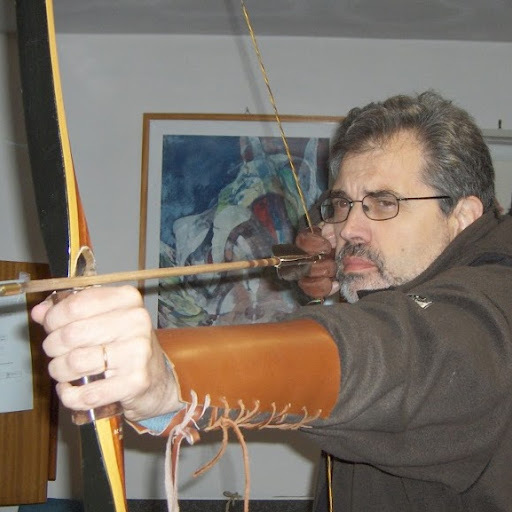 He was also accused of being part of a conspiracy designed to cast bears in a bad light and favor their elimination from the forests of Trentino (the latter accusation automatically implies the former). Most of the debate seems to have missed the fundamental point of this story, which is that both humans and bears simply acted according to their genetic set-up and, probably, couldn't have behaved otherwise. We cannot exclude that Daniza the bear was intelligent enough to choose not to kill Mr. Maturi to avoid angering humans too much. But, most likely, she simply behaved according to the way female bears have always behaved: aggressively defending their cubs against all perceived. On the other side, Mr. Maturi, politicians, and most people, simply behaved according to the way human beings have always behaved; exploiting everything they perceive as a "resource" and aggressively eliminating anything they see as an obstacle. Countries other than Italy may have a less nasty attitude toward wild bears but, everywhere, if wilderness is an obstacle to profit, wilderness always loses. To an IQ test, most human beings (possibly including also Mr. Maturi) will score better than most bears. But, if human beings are individually smarter than bears (at least in their ability to manipulate abstract symbols), that doesn't mean that they are smarter than bears as a species. They way they behave, actually, shows no signs of intelligence as they are simply marching straight on, ruthlessly stomping over everything they see as stopping them in their path. It is our destiny as human beings to destroy what keeps us alive; but, in the end, it is unavoidable: it is what we are. Could we change for the better in the future? Probably not: killing the bear has killed the hope for that. The bell for Daniza is ringing for us. BTW - one result of the Daniza story was a nation-wide call on boycotting the Trentino region. 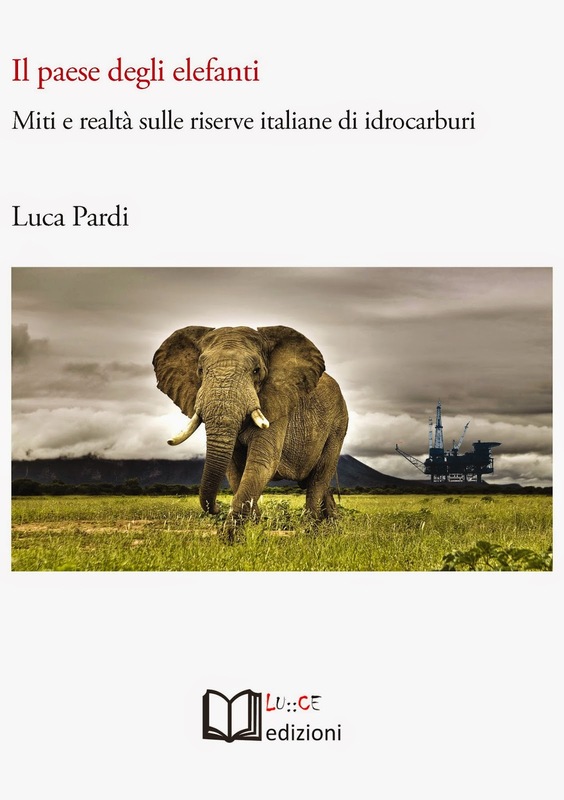 You might consider that: perhaps not all hope is lost..
"Elephant Country" a book on peak oil by Luca Pardi. The title refers to the fact that some politicians had defined Italy an "oil country" because it produces some oil, but that's just as wrong as it would be to say that Italy is an "elephant country" because it has some elephants in zoos. In 2003, I invited Colin Campbell, the founder of the association for the study of peak oil (ASPO), to give a talk in Florence. After the talk, a small group of conspirators (1) collected in my office. We drank together something curiously looking like petroleum in color (not in taste, fortunately); a strong liquor that came from Ukraine and was named "Balzam"(**). After a few glasses of that dark stuff, we decided to start the Italian chapter of ASPO; "ASPO-Italy". One of the conspirators of that fateful day, Luca Pardi, now president of ASPO-Italy, recently published a book on oil and gas with a curious title "Elephant country." It is a word play on some silly remarks on oil by one of our leading politicians, Mr. Romano Prodi, who said that Italy "floats on a sea of oil". But you can take the title of the book also as hinting to the old say about "the elephant in the room". Peak oil is the true elephant in the room of our times; it is there, it is large, you can't miss it, and yet it goes unperceived, unseen, invisible. The invisibility of peak oil is all the more impressive if compared to how much more we know about it today than we did at the beginning. You can see that, clearly, in Pardi's book, which is an excellent summary of the work done up to now on the subject. Compare it with my first book on peak oil, published in 2003, and you'll see that, surely, we came a long way from then. Today, we have better models, better data, and generally a much better understanding of the concepts we summarize under the name of "peak oil." And all these new data and models confirm our initial interpretation: peak oil is here. Yet, the problem of the elephant in the room remains. Peak oil remains a fringe concept, almost never mentioned in the mainstream media and in the political debate. Politicians and their advisers seem to have never even heard of it, and when they do, they misunderstand it. This situation is all the more disappointing if we take into account the amount of intellectual power that was dedicated to the subject. Few fields of science have seen such a group of smart, dedicated, and competent people obtaining such impressive results; normally on a shoestring budget or no budget at all. I would add that this group also had all the appropriate credentials to be taken seriously: university researchers, top level scientists, high level professionals. You would not imagine that the advice of such a group could be ignored. And yet, it was. Rethinking to the work of the past ten years, I almost can't believe how naive we were. We really thought that good data and good models would, eventually, make their way into the consciousness of the decision makers. And, then, someone would have done something about the problem. Yes, we were so naive. We didn't think that we are living in a time in which elephants populate people's living rooms and go routinely unnoticed. We live in the time in which Karl Rove said that, because we are an empire, "we create our own reality." A reality in which seas of oil exist because a politician said so. Just this year, I saw an impressive example of this process of reality creation based on wishful thinking and fake data at the European Parlament, in Brussels. We seem to be geared to see the world through our ideological filters; which work very nicely in keeping reality out. The problem is that virtual reality, no matter how powerful is the empire that created it, tends to shatter to pieces when it gets in contact with real reality. Virtual seas of oil tend to be badly trampled by the virtual elephants populating the living room, but we still tend to stick to our filters as long as we can. Peak oil just can't pass the filter. So, the ongoing crash of the oil market goes not only unnoticed, but perceived as a good thing. It is likely that the closer we get to the global peak, the less we will perceive it. And when we pass it (and we may already have passed it) it will become a truly invisible elephant hiding behind the sofa in the living room. As we slide down the Seneca cliff, we'll think it is just a bump in the road to everlasting prosperity. (*) For the historical record, the founders of ASPO-Italy who collected in Ugo Bardi's office over a few glasses of Ukrainian "balzam" were (in addition to Ugo Bardi) Luca Pardi, Francesco Meneguzzo, Giovanni Marocchi, and Renato Guseo (or at least those are the people I remember). The graph above is a little exercise in cliodynamics, the attempt of quantitatively modeling historical data. Here, the size of the great Egyptian pyramids is plotted as a function of their approximate building date, taken as the last year of the reign of the Pharaoh associated to them. The data are fitted with a simple Gaussian, which approximates the cycle of the Hubbert model of resource depletion. The great Egyptian pyramids built during the 3rd millennium BCE are the embodiment of the power and of the wealth of the Egyptian civilization of the time. But why did the Egyptians stop building them? Not lack of interest, apparently, since they kept building pyramids for a long time. But they never built again pyramids on such a giant scale. Probably, we will never have sufficient data to understand the economics of the Egyptian pyramid building cycle of the 3rd and 4th Egyptian dynasties. But we can try at least to examine the quantitative data we have. So, I went to Wikipedia and I found data for the size of pyramids and their approximate dates. The result is the graph above. Here, I show only the data for completed pyramids as a function of the last year of the reign of the Pharaoh associated for each one. As you can see, it is possible to fit the data with a Gaussian curve, which approximates the Hubbert curve, known to describe the depletion of a limited, non renewable resource. This suggests that the Egyptians had run out of resources, possibly in the form of the fertile soil necessary to sustain the large workforce needed to build pyramids. Or, perhaps, in an age of increasing warring activity, they were forced to funnel more and more resources into the military sector, taking them away from pyramid building. Another phenomenon we can note in the graph is the rapid collapse of the size of the pyramids at the end of the cycle. The last pyramid of this cycle, the one associated to Pharaoh Menkaure, is even smaller than the first one of the cycle, the "stepped pyramid" of Pharaoh Djoser. Perhaps, this rapid decline is a manifestation of the "Seneca Effect", a term that I coined to describe economic cycles in which decline is faster than growth. Unfortunately, however, the data are too scattered and uncertain to be sure on this point. But surely there was no "plateau" nor a slow decline after the construction of the largest pyramids andit is suggestive to think that even pyramid building may be described with Seneca's words "increases are of sluggish growth, but the way to ruin is rapid." 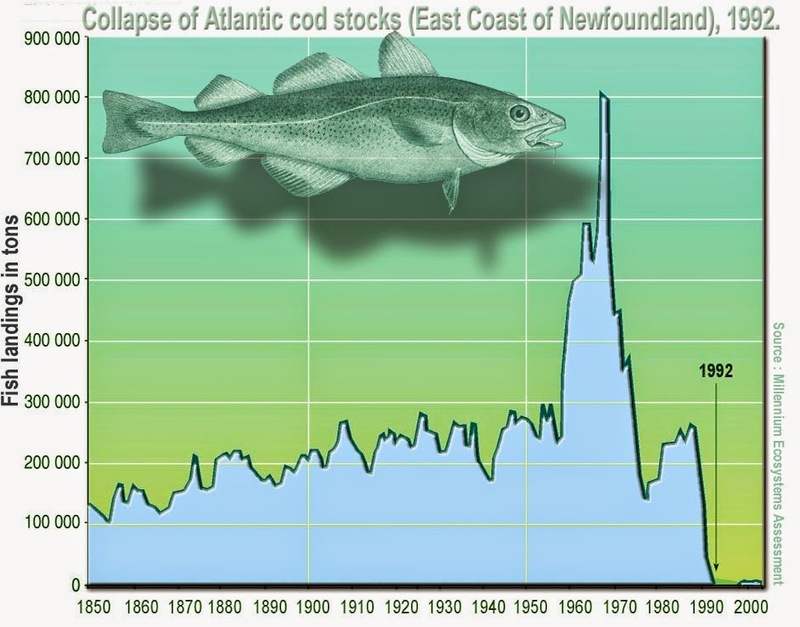 The image above (from Wikipedia) shows the collapse of the North Atlantic cod stocks. The fishery disaster of the early 1990s was the result of a combination of greed, incompetence, and government support for both. Unfortunately, it is just one of the many examples of how human beings tend to worsen the problems they try to solve. The philosopher Lucius Anneus Seneca had understood this problem already some 2000 years ago, when he said, "It would be some consolation for the feebleness of our selves and our works if all things should perish as slowly as they come into being; but as it is, increases are of sluggish growth, but the way to ruin is rapid." The similarity with the cod landings curve is only approximate, but clearly, in both cases we have a very rapid decline after a slow growth that, for the cod fishery, had lasted for more than a century. What caused this behavior? 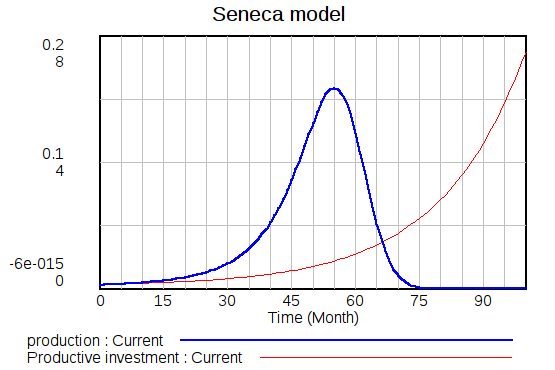 The Seneca curve is a special case of the "Hubbert Curve" which describes the exploitation of a non renewable (or slowly renewable) resource in a free market environment. 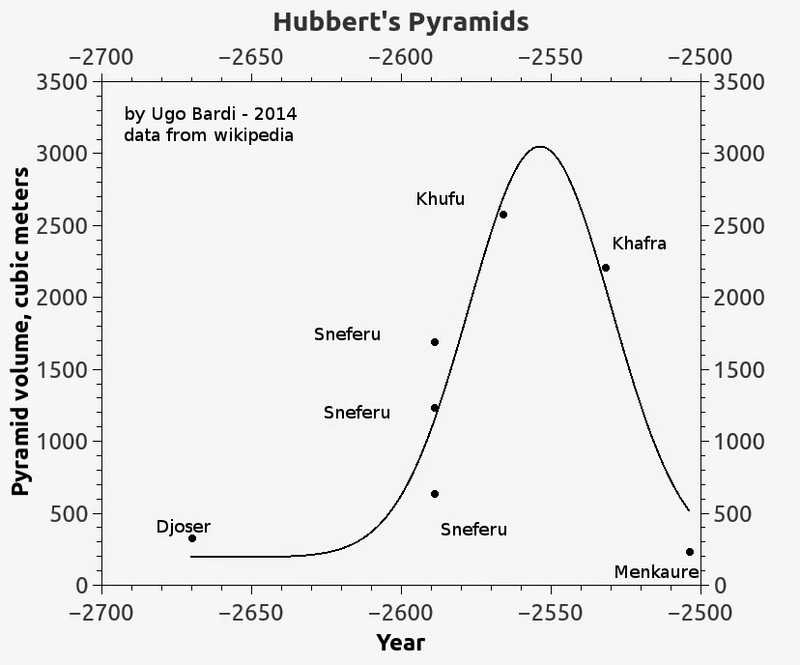 The Hubbert curve is "bell shaped" and symmetric (and it is the origin of the well known concept of "peak oil). The Seneca curve is similar, but it is skewed forward. In general, the forward skewness can be explained in terms of the attempt of producers to keep producing at all costs a disappearing resource. There are several mechanisms which can affect the curve. In my first note on this subject, I noted how the Seneca behavior could be generated by growing pollution and, later on, how it could be the result of the application of more capital resources to production as a consequence of increasing market prices. However, in the case of the cod fishery, neither factor seems to be fundamental. Pollution in the form of climate change may have played a role, but it doesn't explain the upward spike of the 1960s in fish landings. Also, we have no evidence of cod prices increasing sharply during this phase of the production cycle. Instead, there is clear evidence that the spike and the subsequent collapse was generated by technological improvements. Fishing changed as new technology for catching cod and shrimp developed, and boats became larger. A handful of fishermen shifted to trawling or “dragger” gear. The federal government played a decisive role introducing new technology and providing financial resources to fishermen who were willing to take the risk of investing in new gear and larger boats. Fishermen in open boats and some long-liners continued to fish cod, lobster and seal inshore. Meanwhile draggers and other long-liners moved onto the open ocean, pursuing cod and shrimp nearly year round. At the height of the boom, dragger captains made $350,000–600,000 a year from cod alone. ... The federal government helped finance boat improvements, providing grants covering 30–40% of their cost. By the late 1980s, some fishermen recognized signs of decline. Open boats and long-liners could rarely reach their quotas. To find the remaining cod, fishermen traveled farther north, deployed more gear and intensified their efforts. A few began shifting to alternative species such as crab. Cheating fisheries regulation—by selling unreported catches at night, lining nets with small mesh and dumping bycatch at sea—was said to be commonplace. Large illegal catches on top of too-high legal quotas drew down the resource. Some say they saw trouble coming, but felt powerless to halt it. So, we don't really need complicated models (but see below) to understand how human greed and incompetence - and help from the government - generated the cod disaster. Cods were killed faster than they could reproduce and the result was their destruction. Note also that in the case of whaling in the 19th century, the collapse of the fishery was not so abrupt as it was for cods, most likely because, in the 19th century, fishing technology could not "progress" could not be so radical as it was in the 20th century. The Seneca collapse of the Atlantic cod fishery is just one of the many cases in which humans "push the levers in the wrong directions", directly generating the problem they try to avoid. If there is some hope that, someday, the cod fishery may recover, the situation is even clearer with fully non-renewable resources, such as oil and most minerals. Also here, technological progress is touted as the way to solve the depletion problems. 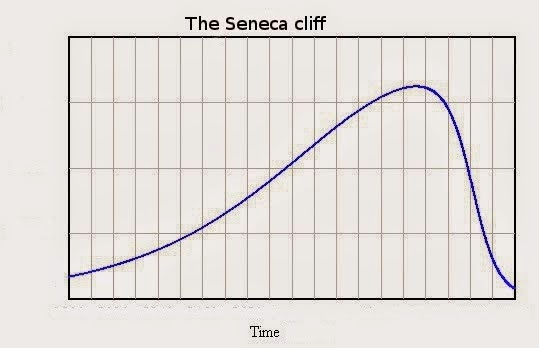 Nobody seems to worry about the fact that the faster you extract it, the faster you deplete it: that's the whole concept of the Seneca curve. So take care: there is a Seneca cliff ahead also for oil! A simple dynamic model to describe how technological progress can generate the collapse of the production of a slowly renewable resource; such as in the case of fisheries. The basics of a system dynamics model describing the exploitation of a non renewable resource in a free market are described in detail in a 2009 paper by Bardi and Lavacchi. According to the model developed in that paper, it is assumed that the non renewable resource (R) exists in the form of an initial stock of fixed extent. The resource stock is gradually transformed into a stock of capital (C) which in turn gradually declines. The behavior of the two stocks as a function of time is described by two coupled differential equations. where R' and C' indicate the flow of the stocks as a function of time (R' is what we call "production"), while the "ks" are constants. This is a "bare bones" model which nevertheless can reproduce the "bell shaped" Hubbert curve and fit some historical cases. 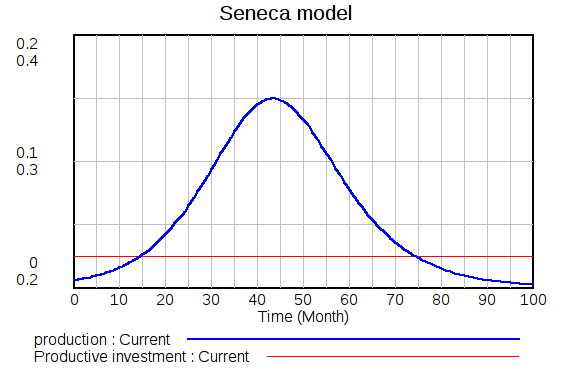 Adding a third stock (pollution) to the system, generates the "Seneca Curve", that is a skewed forward production curve, with decline faster than growth. R' = - k1*k3*C*R C' = ko*k2*C*R - (k3+k4)*C.
Here, "k3" explicitly indicates the fraction of capital reinvested in production, while k4 which is proportional to capital depreciation (or any other non productive use). 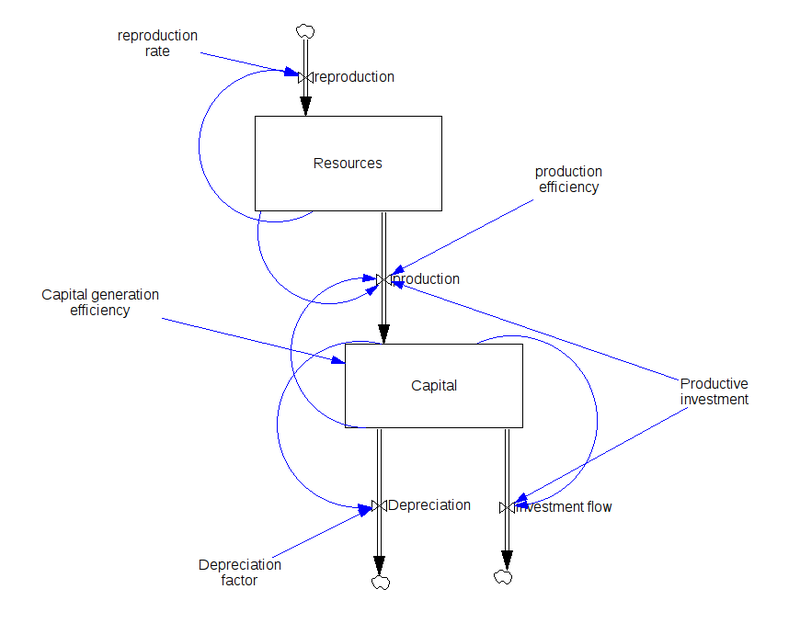 Then, we assume that production is proportional to the amount of capital invested, that is to k3*C. Note how the ratio of R' to the flow of capital into resource creation describes the net energy production (EROI), which turns out to be equal to k1*R. Note also that "ko" is a factor that defines the efficiency of the transformation of resources into capital; it can be seen as related to technological efficiency. If the constants remain constant during the run, the model is the same as the well known "Lotka-Volterra" one. If the reproduction rate is set at zero, the model generates the symmetric Hubbert curve. In order to simulate technological progress, the "production efficiency" constant is supposed to double stepwise around mid-cycle. A possible result is the following, which qualitatively reproduces the behavior of the North Atlantic cod fishery. Among other things, this result confirms the conclusions of an early paper of mine (2003) on this subject, based on a different method of modeling. Let me stress again that this is not an academic paper. I am just showing the results of tests performed with simple assumptions for the constants. Nevertheless, these calculations show that the Seneca cliff is a general behavior that occurs when producers stretch out their system allocating increasing fractions of capital to production. Should someone volunteer to give me a hand to make better models, I'd be happy to collaborate! A fundamental tenet of scientists and climate concerned people is that "you must not scare people about the climate threat". Sure: we all know that. It is reasonable, it makes sense, it is even obvious: if you say how bad you think the situation is, if you even mention the worst case hypothesis, they will close their ears singing to themselves "la-la-la!" while they run away. If you are not careful, they will not want to hear what you are telling them, and if they don't hear you they will do nothing. And if they do nothing, the problem will not be solved. It is standard practice in risk management. So, we have always been careful to follow the instructions: avoid scaring people, avoid looking like scaremongers, avoid even hinting that things may be worse, much worse than anyone could imagine. We have been careful to end all warnings with a list of solutions; saying that, sure, it looks bad, but the problem will go away if you just insulate your home, buy a smaller car, and turn off the lights when you leave a room. What we need is just a little bit of good will. To no avail: the climate problem is still there, bigger and more fearsome everyday. Nothing changes, nothing moves, nothing is being done. Nothing even remotely comparable to the scale of the threat. And, sometimes, you feel that you have had enough; you feel like screaming that this is NOT a problem you can solve with double-paned windows and smaller cars; it is NOT a problem for the next century; it is NOT a problem for another generation, It is here, it is now, it is big, it is damn big, and it is out of control. You feel like screaming that aloud. "The last time there was this much CO2 in the air the oceans were 80 feet higher than they are now. Two things you should know: Half the world's population lives within 120 miles of an ocean." "And the other?" "Humans can't breathe under water." 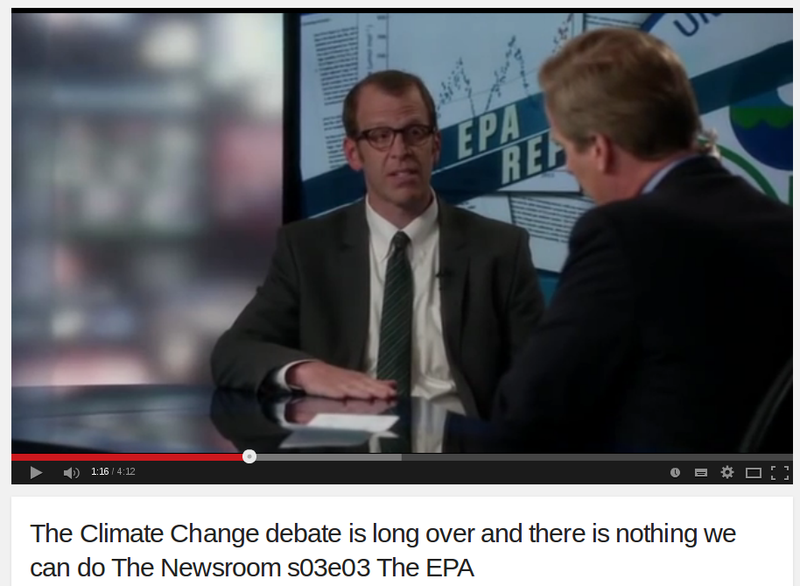 A scene on Aaron Sorkin's The Newsroom recently struck me, at first, as simply an astute and amusing commentary on global warming... until the real world chimed in with one of those life-imitating-art occasions suggesting that R.E.M. 's apocalyptic song is destined to be the soundtrack of our future. First, the HBO moment: Anchor Will McAvoy (Jeff Daniels) interviews an EPA administrator (Paul Lieberstein, who will always be Toby Flenderson from The Office no matter what role he's playing) about a report that carbon dioxide levels have hit extremely dangerous new highs. "If you were the doctor and we were the patient," the anchor asks, "what's your prognosis? A thousand years, two thousand years?" The scientist's response takes him aback: "A person has already been born who will die due to catastrophic failure of the planet." McAvoy: You're saying the situation is dire? EPA: Sure. It's as if you're sitting in your car, in your garage, with the engine running and the door closed, and you've slipped into unconsciousness. And that's it. EPA: Then you'd be saved. McAvoy: OK. So now what's the CO2 equivalent of the getting there on time? EPA: There isn't a position on this any more than there's a position on the temperature at which water boils. Then last week, an actual piece of journalism, the lead story in Monday's New York Times, confirms that things are indeed pretty much as desperate as Sorkin depicted on his pretend newscast. As the latest UN summit on greenhouse gases convenes in Peru, climate scientists report that a 3.6 degree rise seems inevitable, which they believe is "the tipping point at which the world will be locked into a near-term future of drought, food and water shortages, melting ice sheets, shrinking glaciers, rising sea levels and widespread flooding." Flipping back to one last bit of patter from The Newsroom: The EPA administrator tells McAvoy, "The last time there was this much CO2 in the air the oceans were 80 feet higher than they are now. Two things you should know: Half the world's population lives within 120 miles of an ocean." "And the other?" "Humans can't breathe under water." I propose that it is time for us to accept as a premise in whatever environmental discussions we have -- or indeed, in any deliberations on anything taking place in the future -- the fact that the world is coming to an end. Well, not the world itself: The planet is actually pretty resilient, and will likely continue on its orbit unbothered by the warm spell; it's just people, along with most other life forms, that will disappear. Geologically, there's not so much to worry about; biologically, on the other hand, we have a situation. Over the past decade -- since Al Gore's documentary An Inconvenient Truth brought global warming into the mainstream consciousness -- the rhetoric has been dire, but at least minimally hopeful: If we start doing this and stop doing that now, we can perhaps just barely salvage what is left of our ecosystem. But now it's time to accept our impending demise. Those are profoundly difficult words to write, but they are necessary: Our times demand a new rhetorical honesty. It is deceitful and irrelevant to sustain the charade that things may improve. Instead, it's time to start talking about how we will die. As depressing as this is, it has at least the virtue of being true, unlike the kick-the-can-down-the-road policies that pretend the solution for global warming lies in producing (someday!) cars that get 150 mpg and cities powered by wind farms. And expecting Westerners (the 12 percent of the world's population who consume 60 percent of its resources) to use less stuff. If there's a silver lining, it is not a very satisfying one, but for what it's worth: I think it may prove refreshing, even exhilarating, to develop a new trope, a new truth, that lets go of the pretense that things will turn out ok.
"The progress narrative" that has undergirded Western culture for millennia was nice while it lasted, but it's also responsible for getting us where we are today, as it stoked the fantasy that we were invincibly moving ever forward, and that our rampantly voracious overdevelopment (exploration, imperialism, conquest, growth, "civilizing" nature) had no costs, no limits, no consequences. Other cultures at similar points in their trajectory -- past the zenith, clearly waning yet close enough to the glories of the past -- have often produced keenly insightful literature and art. Being on the cusp of decline provokes incisive self-reflection -- as the Greeks called it, anagnorisis: recognition. Cervantes achieved this in Don Quixote toward the end of Spain's Golden Age, as did T. S. Eliot in "The Waste Land," his report from the front lines of the cultural disintegration that accompanied the collapse of European imperialism and the War to End All Wars: "These fragments I have shored against my ruins." On a personal level, we have lately begun to do a better job of dying, and of accepting death -- writing "death plans," forsaking heroic measures of resuscitation. So too as a species we may learn to accept the inescapability of our impending ecological fate. We can celebrate the bright spots from our past human heritage, acknowledge our follies, and finally, deal with it: It is what it is. There will be a limited future audience for this brave new art, since we're hovering on the verge of extinction, but it will leave an interesting time capsule for whoever might come to recolonize the planet after we're gone. "Anthropocene," a recently coined term for our present epoch, reflects the unique phenomenon of human impact that has changed (disrupted, ruined) the earth. Complementing this scientific assessment, a parallel aesthetic movement must acknowledge, better late than never, that we have irreparably fouled our nest. We might demarcate our cultural expressions of this period as "epitaphal": our last words, as on a gravestone, inscribed with a solidity that will outlast our mortal frames and will announce for eternity (even in its conscribed scope) what kind of people we wanted to be and how we hoped we might be remembered. Randy Malamud is Regents' Professor of English and chair of the department at Georgia State University. Fossil fuels: are we on the edge of the Seneca cliff? "It would be some consolation for the feebleness of our selves and our works if all things should perish as slowly as they come into being; but as it is, increases are of sluggish growth, but the way to ruin is rapid." 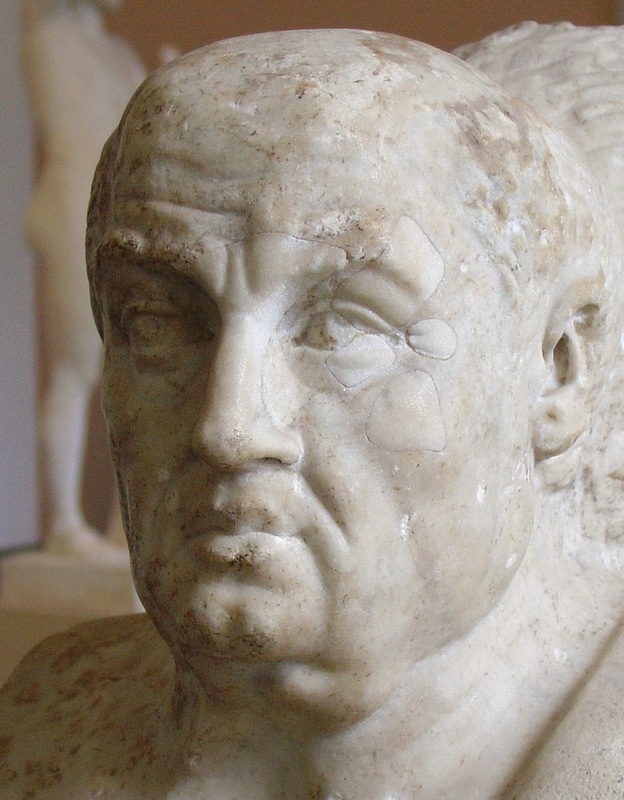 Lucius Anneaus Seneca, Letters to Lucilius, n. 91. This observation by Seneca seems to be valid for many modern cases, including the production of a nonrenewable resource such as crude oil. Are we on the edge of the "Seneca cliff?" It is a well known tenet of people working in system dynamics that there exist plenty of cases of solutions worsening the problem. Often, people appear to be perfectly able to understand what the problem is, but, just as often, they tend to act on it in the wrong way. It is a concept also expressed as "pushing the lever in the wrong direction." With fossil fuels, we all understand that we have a depletion problem, but the solution, so far, has been to drill more, to drill deeper, and to keep drilling. Squeezing out some fuel by all possible sources, no matter how difficult and expensive, could offset the decline of conventional fields and keep production growing for the past few years. But is it a real solution? That is, won't we pay the present growth with a faster decline in the future? It is not just a theoretical model: there are several historical cases where the production of a resource collapsed after having reached a peak. For instance, here are the data for the Caspian sturgeon, a case that I termed "peak caviar". Do we risk to see something like this in the case of the world production of oil and gas? In my opinion, yes. There are some similarities; both fossil fuels and caviar are non-replaceable resources; and in both cases prices went rapidly up at and after the peak. So, if Caspian sturgeon showed such a clear Seneca cliff, oil and gas could do the same. But let me go into some details. 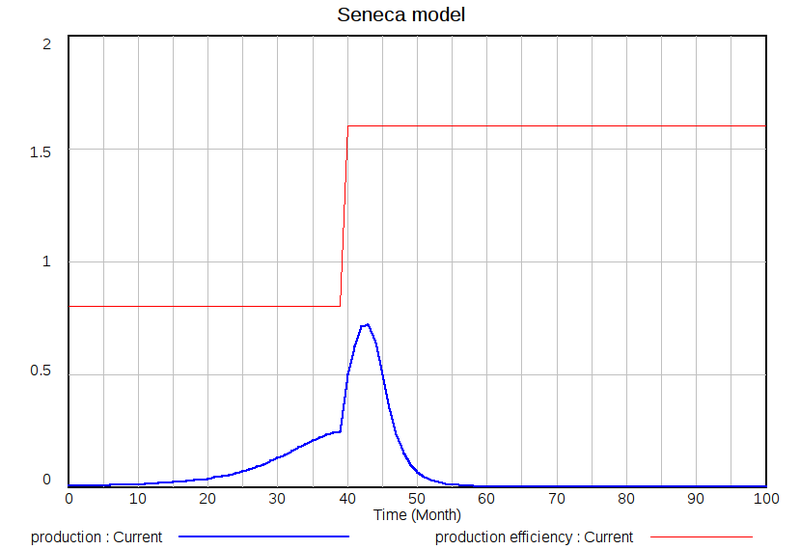 In the first version of my Seneca model, the fast decline of production was interpreted in terms of growing pollution that places an extra burden on the productive system and reduces the amount of resources available for the development of new resources. However, I found that the Seneca behavior is rather robust in these systems and it appears every time people try to "stretch out" a system to force it to produce more and faster than it would naturally do. So, in the case of the Caspian sturgeon, above, growing pollution is unlikely to be the cause of the rapid collapse of production (even though it may have contributed to the problem). Rather, the main factor in the collapse is likely to have been the effect of the growing prices of a rare and non replaceable resource (caviar). High prices enticed producers to invest more and more resources in raking out of the sea as much fish as possible. It worked, for a while, but, in the end, you can't fish sturgeon which isn't there. It ended up in disaster: a classic case of a Seneca Cliff. Can this phenomenon be modeled? Yes. Below, I describe the model for this case in some detail. The essence of the idea is that producers need to reinvest a fraction of their profits in developing new resources in order to keep producing. However, the yield of the new investments declines as time goes by because the most profitable resources (e.g. oil fields) are exploited first. As a result, less and less capital is available for new investments. Eventually production reaches a maximum, then it declines. If we assume that companies re-invest a constant fraction of their profits in new resources, the model leads to the symmetric bell shaped curve known as the "Hubbert Curve." However, as I describe in detail below, decline can be postponed if high prices provide extra capital for new productive developments. Unfortunately, growth is obtained at the cost of a fast burning out of capital resources. The final result is not any more the symmetric Hubbert curve, but a classic Seneca curve: decline is more rapid than growth. Is this what we are facing for fossil fuels? Of course, we are only dealing with qualitative models, but, on the other hand, qualitative models are often robust and give us an idea of what to expect, even though they can't tell us much in terms of predicting events on a precise time scale. The ongoing collapse of oil prices may be a symptom that we are running out of the capital resources necessary to keep developing new fields. So, what we can say is that there are some good chances of rough times ahead - actually very rough. The Seneca cliff may well be part of our near term future. Note: this is not a formal scientific paper; it is more a rough "back of the envelope" calculation designed to show how increasing capex fractions can affect the production rate of a non renewable resource. If someone could give me a hand to make a more refined and publishable study, I would be happy to collaborate! C' = ko*k2*C*R - (k3+k4)*C.
Here, "k3" explicitly indicates the fraction of capital reinvested in production, while k4 which is proportional to capital depreciation (or any other non productive use). 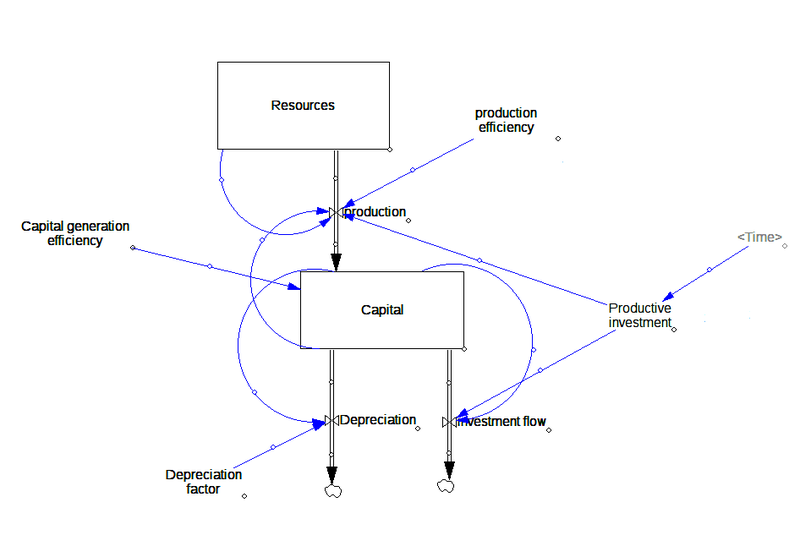 Then, we assume that production is proportional to the amount of capital invested, that is to k3*C. Note how the ratio of R' to the flow of capital into resource creation describes the net energy production (EROI), which turns out to be equal to k1*R. Note also that "ko" is a factor that defines the efficiency of the transformation of resources into capital; it can be seen as related to technological efficiency. These points will not be examined in detail here. Things change if we allow "k3" to vary over the simulation cycle. The characteristic that makes "k3" (productive investment fraction) somewhat different than the other parameters of the model, is that it is wholly dependent on human choice. That is, while the other ks are constrained by physical and technological factors, the fraction of the available capital re-invested into production can be chosen almost at will (of course, there remains the limit of the total amount of available capital!). Higher prices will lead to higher profits for producers and to the tendency to increase the fraction reinvested in new developments. It is also known that in the region near the production peak prices tend to be higher - as in the historical cases of whale oil and caviar and whale oil. In the case of caviar, the price rise was nearly exponential, in the case of whale oil, more like a logistic curve. Assuming that the fraction of reinvested capital varies in proportion to prices, some modeling may be attempted. Let me show here the results obtained for an exponential increase of the fraction of reinvested Capex. I have also tried other functions for the rising trend of k3. The results are qualitatively the same for a linear increase and for a logistic one: the Seneca behavior appears to be robust, as long as we assume a significant increase of the fraction of the reinvested capex. Let me stress once more that these are not supposed to be complete results. These are just tests performed with arbitrary assumptions for the constants. Nevertheless, these calculations show that the Seneca cliff is a general behavior that occurs when producers stretch out their system allocating increasing fractions of capital to production.